Tap into your spiritual side at this super-Zen book signing event. Author Sharon Gannon will discuss and sign her new book, The Magic Ten and Beyond: Creating a Personalized Daily Spiritual Practice for Greater Peace and Well-Being. 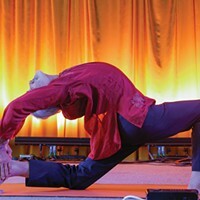 The Woodstock-based yogini and health activist founded Jivamukti Yoga in Manhattan. She advocates for animal rights and is well-known for founding the Jivamukti method of yoga. Her "Magic Ten" refers to 10 weeks of spiritual practices, including meditation, prayer, and several types of yoga. Gannon will talk about The Magic Ten and Beyond at Mirabai of Woodstock bookstore on July 21 at 2pm. The event is free—plus, the book is 10 percent off on the day of the event. (845) 679-2100.